Amit Sheth was not our first choice. Not that his credentials were unimpressive. Just that our expectations were a notch higher. Our annual leadership retreats are known for their glittery speakers. The alternatives enjoyed a brand edge, Rahul Bose and Chetan Bhagat. But my wife, Ritu, strongly recommended Amit as she had attended his session before. Plus we felt adventurous, so Amit got lucky. The 90-minute rendezvous proved otherwise. The adventurous one was on the stage, the lucky ones in the audience. The above viewpoint got more intriguing when I marveled the starting-line aspirant was a 38 year old who had never pursued physical fitness before. 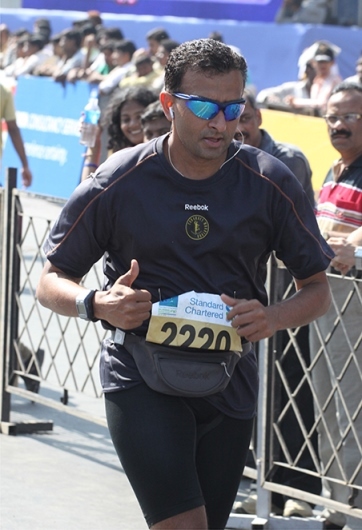 It was not an unfulfilled childhood passion that provoked Amit to take up marathons. You see, he didn’t put on his running shoes because he wanted to do something. Rather he put them on because he didn’t want to do nothing. So he “invented” his goal. And in the process he was redefining the way our world stereotypes the ingredients of success. We are in the habit of anticipating steadfast goals in the eyes of tomorrow’s achievers. But often the victors are not the ones with unwavering ambitions, rather the ones who are tired of living a life of boring desperation and choose to do something about it! I was bemused by Amit’s refreshing take. Except for one glaring gap in his approach. Let’s face it, where is the excitement in running? What can be more boring than running up and down the ghats of Lonavala from midnight to the wee morning hours? Amit undertook this rigorous ordeal for months in preparation of big races. I couldn’t even imagine what that must feel like. What was the point? Torturing your body. Breaking your mind. All thoughts must be in random disarray as one gasped for air. Perhaps, every second breath must be spent in convincing self that the race will eventually get over, that it’s all in the mind! Great summary of Amit’s presentation. Truly, he is the master of his mind and body. 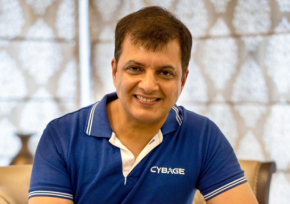 I was fortunate to be there, amongst Cybage’s great leaders, at royal banquet hall of Hyderabad’s Falaknuma palace and attend Amit’s quite inspiring presentation. I also had a candid chat with him on the way to airport. I am reading through his autographed book, ‘Dare to Run’ and re-started my morning run…and this time few KMs more…out of our hosing society boundary. I could find the correlation between the science of success and the third eye easier now to interpret. Kudos to Amit … who lives his life by his intellect… totally governing the mind and body! This reminds me, how I finally dived the first time in a swimming pool from a high board (ten feet). I used to stand at the corner of the diving board gazing at the water from the top. Then after some time come back by climbing down the ladders. I repeated the same many times. Loved the title “The Third Eye”. Truly an inspiring story of Mr. Amit Sheth and no doubt being the first from our nation to complete an ultra marathon is an incredible feat. Coincidentally I too started running because even I didn’t want to do nothing. The trick definitely lies in learning to ‘ignore’ it slowly and steadily. It would be six months that I myself started running after joining our very own “Runfordun” club and will be attempting my first Half Marathon next month in PRBM. Loved the article and got to learn a lot from it. A nice write up about Amit Sheth. Certainly he is one of Prides of India!!! All the best Arun Sir! Dear Arun. People who are inherently Wise get far more out of everything than ordinary people. You took more out of my talk than I probably meant. I’m delighted that you took so much time to share your insights and thank you for the generous words of praise. I’m truly delighted for having this written about my talk. Been a real pleasure !!! Thanks. As usual thought provoking article!Amit’s way can be called as Meditation in motion where for a change the body is in motion instead of being stationary however the internal process that happens in meditation like observation of body and disassociation from body being same only to discover that one is beyond the body! I can relate “Meditation in Motion” when I attempted experimental solo walkathon for 3 hours covering almost 20-21kms in Pune. It was very thought provoking and learning experience as a pedestrian. Looking forward for more such experimental walks. Cheers!